OPTEC International is a publicly traded, fully reporting OTC company and worldwide provider of green technologies for continued global reduction of fossil fuel usage, pollution and greenhouse gas emissions. The Company holds the worldwide license for marketing and distribution of OPTEC Fuel Maximizer products. 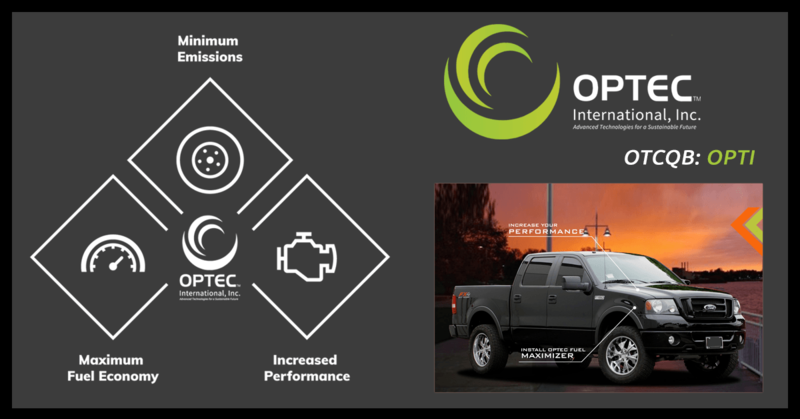 The OPTEC Fuel Maximizer is a patented, plug-in-play aftermarket automotive device. By improving the overall combustion process, it enables modern, combustion engines to substantially reduce unburned hydrocarbons and harmful emission while simultaneously increasing engine performance and fuel economy.